I love the Mission: Impossible franchise. Granted, I really haven’t started loving the franchise until the last film, but now I can say I love it after seeing the most recent entry, Rogue Nation, which was just released. Christopher McQuarrie, the Oscar-winning writer behind films like The Usual Suspects and Valkrie, as well as having written and directed 2012’s Jack Reacher, is now the writer-director of the latest Mission: Impossible. It’s been made apparent that Tom Cruise and McQuarrie have discovered a terrific working relationship, as McQuarrie has either written the screenplay to some of Cruise’s last couple of films, or did some uncredited work on his films (see the last Mission: Impossible film, Ghost Protocol). I was really looking forward to the next Mission: Impossible film, and what made it even better was that Paramount moved the film from Christmas Day of this year to July 31st (to avoid competition from Star Wars). But as the film was being screened for critics, I couldn’t find a negative thing about this film when reviews came in. The film has a current score of 93% on Rotten Tomatoes (as of August 1st), so I knew I had to go see this opening night. It’s been a tradition with my longtime friend to go see Tom Cruise movies on opening night, and we went out with a bang with this one. 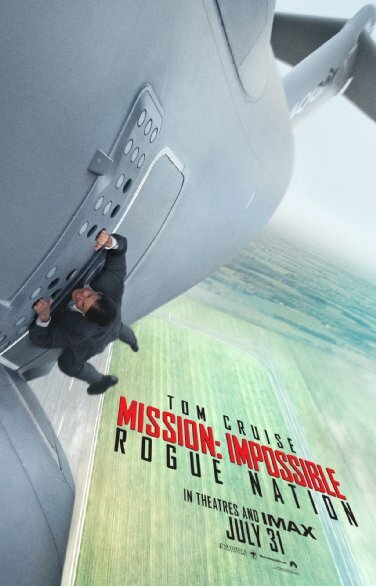 Here’s my review of Mission: Impossible – Rogue Nation. Rogue Nation follows the events that occurred in Ghost Protocol. The IMF has been disavowed, and the CIA has now seized the former spy agency, thanks to the Director played by Alec Baldwin. Brandt, played once again by Jeremy Renner, has been forced to work for the CIA, Benji, played again by Simon Pegg, is working a desk job, and Luther, played again by Ving Rhames, is being forced into the CIA as well. The one problem is that nobody can find Ethan Hunt, played once again by Mr. Cruise. Ethan is hiding out from the CIA, trying to locate a mysterious organization known as The Syndicate, who is a rogue nation (get it?) of agents who are tasked with causing chaos. Early on in the film, Ethan escapes The Syndicate thanks to an agent in the organization played by Rebecca Ferguson, who Hunt as well as his team aren’t entirely sure if she’s trustworthy or not. Rogue Nation never runs out of steam throughout it’s over two-hour runtime, as each set piece somehow is able to top itself, time and time again. That sequence in which Tom Cruise was actually strapped to an airplane that was flying 5,000 feet above the ground? That opens the movie, believe it or not. We get what are arguably some of the best action sequences of the whole franchise, with that air-bus scene, to motorcycle/car chases, underwater adventures (which is mighty impressive) and a brilliant Opera House sequence, and much more. All of these set pieces, which are all brilliantly put together, mixed in with a terrific screenplay by McQuarrie, great performances by everyone from Cruise to newcomer Ferguson, help make Rogue Nation a great late addition to the summer movie season, and is one of the very best films I’ve seen so far this year. What still makes these films continually entertaining and exciting is Tom Cruise, the longtime star/producer of this franchise. Say what you will about Mr. Cruise, but the man is still a movie star in the sense of the word. Not only is he one of the finest actors in general (from his brilliant performances in films like Magnolia and Collateral) but the man is one of the great action stars of this or any generation. The fact that a 53 year-old man is able to continue performing his own stunts in some sequences that are downright nail-biting (especially this underwater sequence). Even though Cruise has been putting out quality action films since the release of the last one, this is easily the best film he’s done since that last Mission: Impossible. Pegg is also great as the comic relief Benji, who gets to share nearly all of the great sequences this film has to offer. It’s great to see Rhames again, after just a cameo in the last film, and Jeremy Renner is still great, even if he’s sidelined mostly as working for the CIA for most of the film (Entertainment Weekly did an interesting article about that here). Alec Baldwin is a nice addition to the film, even if he isn’t on-screen all that much during the film, but the breakout performance is from Rebecca Ferguson, a newcomer from Sweden, who was nominated for a Golden Globe from her performance in a mini-series titled The White Queen a few years back, but hasn’t broken out until now. She’s easily the best performance of the whole film, and has some terrific chemistry with her co-stars, mainly with Cruise. If this film has a bigger box office weekend than predicted (some are estimating $50 million), I wouldn’t be surprised if she’s the talk of the town come Monday. If McQuarrie was able to top the last film in scope, he somehow has. The film goes to more locales around the world than any other Mission: Impossible before, with the action in the film taking place from Vienna, to Morocco, to London, and so on. I remember reading just a few months ago that McQuarrie and Cruise were having trouble trying to figure out a proper ending for the film, and without spoiling anything (obviously) they crafted an ending that isn’t as big as the other set pieces in the film, but is equally intense and fitting for the rest of the film. And I think that’s gonna wrap it up for me. Rogue Nation is the best in the series to date, with Cruise and co. finally figuring out the winning formula for this long running franchise. I’m already waiting to buy my ticket for the next Mission: Impossible (which, according to Cruise, shouldn’t be too far out now). As I mentioned before, this is one of the best films of the year, and is right next with Mad Max: Fury Road as being my two favorite films of the summer. Chances are you aren’t doing much this weekend, so if you wanna have some fun this weekend, do yourself a favor, beat the heat, and go see Mission: Impossible – Rogue Nation.